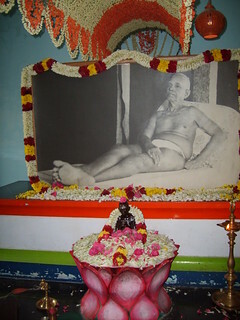 A rare statue of Bhagavan was installed in the Meditation Hall in 1992. The sketch for making this statue was drawn in the holy presence of Bhagavan in the late 1940’s by sculptor Sri Warkhede from Maharashtra. Tamil Parayanam consisting of Ramana Stuti Panchakam and Aksharamanamalai and Sri Ramana Ashtothara Pooja are performed everyday from 6:30a.m to 8:30a.m. The Ashram Library has spiritual books in various languages. The Ashram Meditation Hall and Library are open from 4:30a.m till 9:00p.m. Sri Warkhede, a sculptor from Mumbai came to Bangalore on an assignment and saw a picture of Bhagavan. On enquiry, he came to know that it was Bhagavan Sri Ramana Maharshi’s picture and that he was in Tiruvannamalai. He came for Bhagavan’s darshan and sat in his presence. He felt an urge to take a sketch of Bhagavan to make a statue. (Due to language problem), he was struggling to communicate his wish to the attendant. Seeing this, Bhagavan graciously asked the sculptor to come between 12:00 noon and 2:00 pm. Devotees were restricted from entering the Hall during this period to facilitate Bhagavan to take rest. Sri Warkhede entered the hall at noon and Bhagavan, with great solicitude, asked him how he wanted him to sit (pose), to take the sketch. Sri Warkhede was touched by the grace, and during the two hours, he was alone with Bhagavan, he made a sketch and later, made a statue of Bhagavan. Sri Warkhede later, in an interview, told that, of all the statues that he had made in his lifetime, this alone gave him satisfaction. This statue, which was made by Bhagavan’s Grace in the late 1940’s remained unknown to Sri Warkhede’s family. Swami Hamsananda, during a visit, came to know about this by Divine Grace and requested Sri Warkhede’s son to cast the statue in bronze. This statue then came to Athithi Ashram and was installed in the Meditation Hall by priests from Sri Ramanasramam. Thus, Bhagavan came to Athithi Ashram and he bestows his abundant Grace on all those who seek him. Daily Poojas are performed to this statue.